This morning, as early as 8am I received an email from Melissa. She asked me for a favor to reach out to you guys about a donation towards Japan Relief Fund. She told me her mother & family lives there therefore she was hoping if we could find within our heart & soul to spare a few ringgit and donate. I myself have opened up the link for Groupon since yesterday eversince @joycethefairy tweeted about it but I was overwhelmed with work and haven't bought the donation vouchers yet. But this morning, the first thing I did when I got online was check my mail & buy the vouchers. And if you've read my tweets this morning you'll probably be aware of it. All I can say is that even if we physically cannot be there to help all the tsunami victims, donating is the least we can do. And I quote, "For a slim figure, share your food with those in need". Start giving and donating. Sometimes we are overwhelmed with our own comfort zone, with all the goodness in our life. Enough food or sometimes more than enough food on the table, a roof on our head and clean clothes for us to wear, but that still doesn't stop us on wanting to buy more & more. We get caught up in consumerism. Let's rebalance our life, istiqamah for awhile and start doing some charity. The more we spend on ourselves, the more we should give to charity. Give as much as you can, even the smallest gift is worth a lot to those who needs them the most. You may also opt to buy more than 1 voucher, for MilkADeal each voucher is valued at RM10 each. For Groupon it's RM3 each voucher, and you can also buy as many voucher as you want. 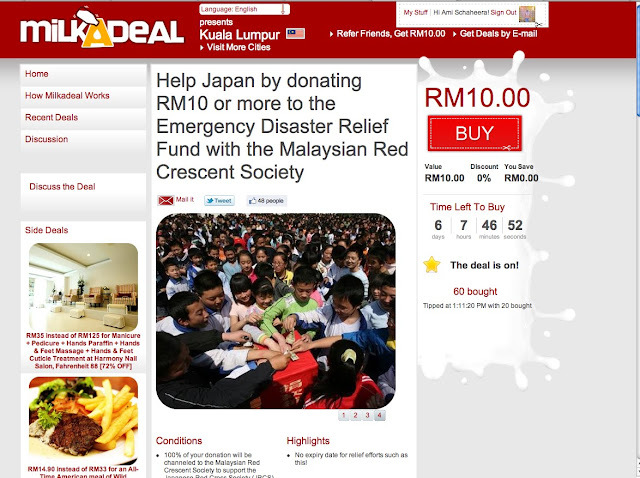 For every RM3 you donate, Groupon Malaysia will match it by donating an additional RM3, so a total of RM6 will go to the Japanese Red Cross Society. 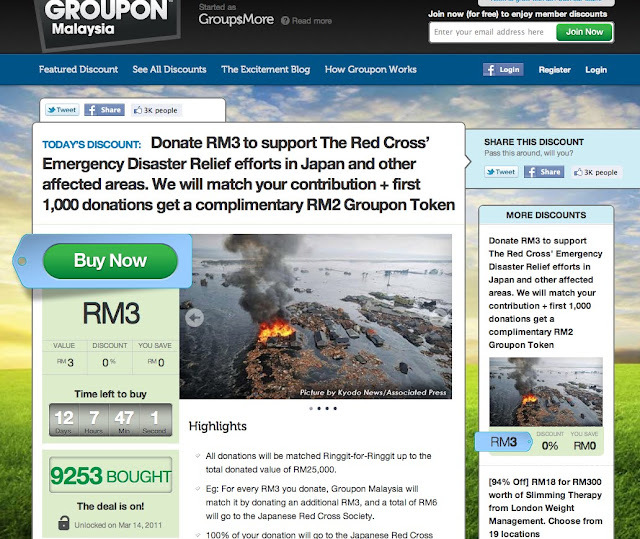 So if you buy 10 pieces of RM3 vouchers from Groupon, a total of RM60 will be donated under your name!